It's true, that at its core, the Tarte au Chocolat is basically a perfect food. There is no part of its construction--usually a shortcrust pastry filled with rich, luxuriant ganache filling--that is not delicious. But in the elite ranks of the tarte au chocolat, some do rise above others. Case in point: this version, topped with candied hazelnuts, from Eric Kayser. 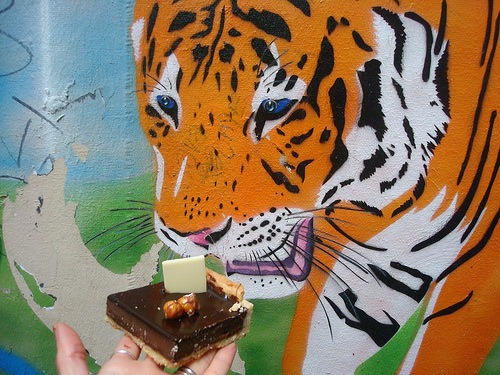 Now, I had headed to Kayser intent on trying the Tigrés (Tiger Tea Cakes) as featured in Dorie Greenspan's book Paris Sweets (which, by the way, if you don't own, I have to say "You've got to be kidding me". Buy it now). But when I got to the bakery, I couldn't seem to drag myself away from the vision of these little chocolate tarts, served in sweet little squares topped with a disc of white chocolate and some candied hazelnuts. And they're CakeSpy approved, too. These tarts are made of magic, starting with a rich and lightly crumbly crust which is brilliantly held together by the sturdy block of ganache which mind-bendingly deep, dark, and mouth-coatingly rich. And delightfully, the garnish--a white chocolate disc and candied hazelnuts--are not merely for looks, but they actually add thoughtful bits of flavor. The hazelnuts add a nice light crunch, and an interesting flavor shot that is simultaneously sweet and savory; the white chocolate is, well, sweet, which is actually quite when nice paired with the rich, slightly bittersweet chocolate flavor. 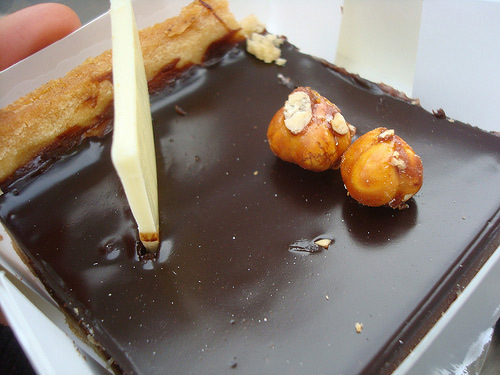 Of course, if there is one warning that I should offer before you seek out this tart, it is that you will want to devote several minutes solely to the eating of this treat: it is one that you will want to pause and savor until each bite of chocolate has melted away. Eric Kayser sweets can be found in Paris (several locations) as well as in Greece, Japan, Russia, Taiwan, Dubai and more locations; find out where at maison-kayser.com. If you want to create this brand of magic at home, you may also be interested in some of his books, including Eric Kayser's Sweet and Savory Tarts .